A glassy sea with a long period swell rolling into Enoshima made it a perfect day for surfing… less so for sailing, never mind sailing a World Cup medal race. In the end only two classes competed, and the Lasers were one of them – fortunately for the British Sailing Team, Elliot Hanson already had a concrete grasp on gold with an extraordinary 43 point lead over New Zealander Thomas Saunders in second place. 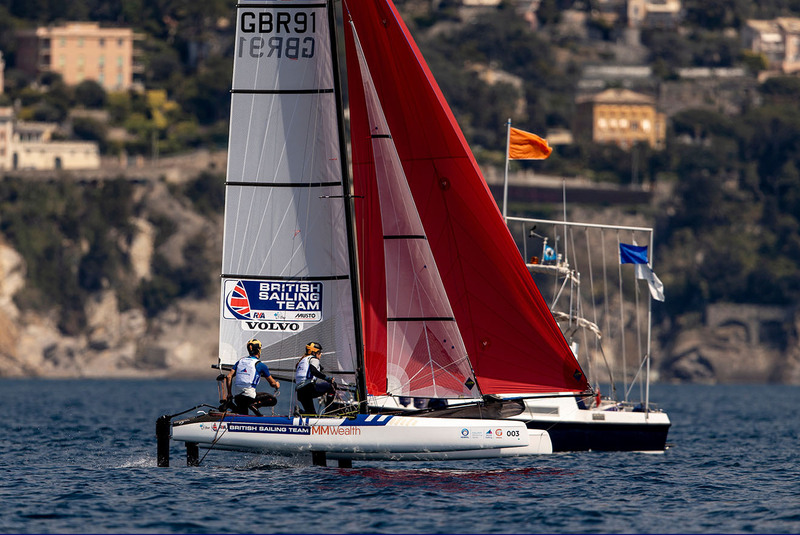 While Hanson grabbed the headlines, Michael Beckett and Lorenzo Chiavarini had also been doing great work all week to make it three British boats in the medal race. 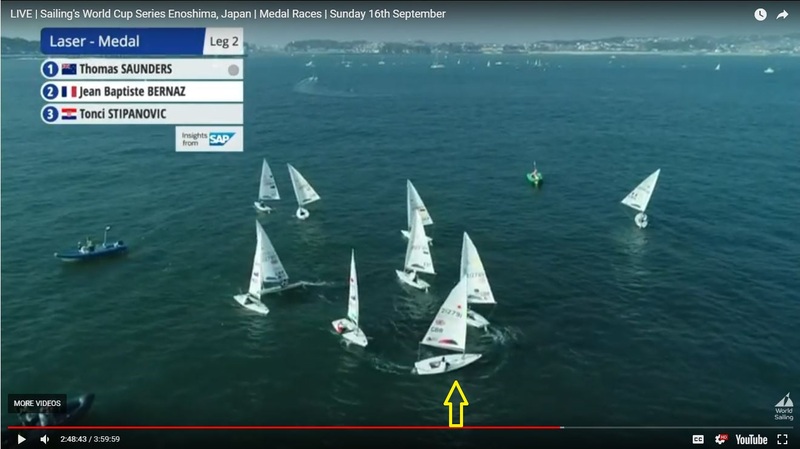 It’s Beckett’s performance that we are going to look at here, as he sailed to within a single place of a bronze medal on the second run in a light 6-7 knot breeze. Let’s start with Image 1 from the top mark at the end of the first leg. Michael Beckett is highlighted in GBR 212791 rounding the mark right behind Elliot Hanson, whose gold medal vest is just about visible. This was always going to be a difficult leg with potential for big gains and losses. The long rolling waves were created by a distant storm, and so they were out of proportion to the light winds. This made it a real balancing act to find the right angle for the best downwind speed (VMG) while taking the good opportunities to surf, and not getting distracted by the bad ones. 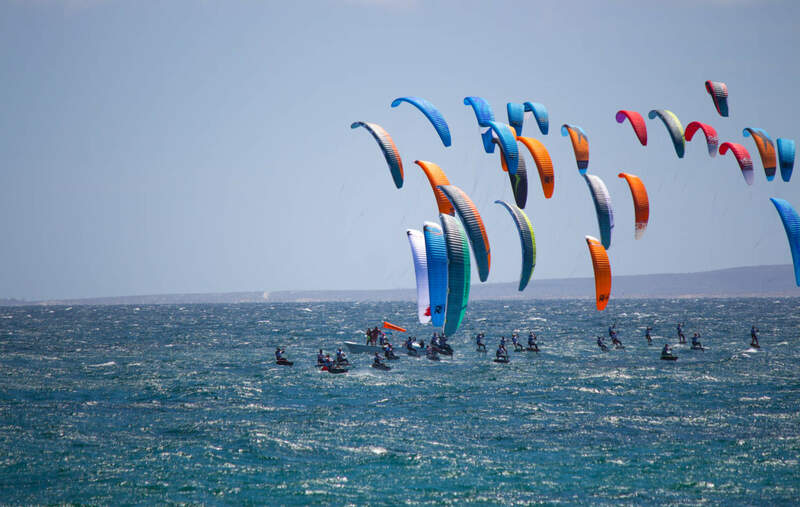 The sailors also had to be very careful that they stayed within the propulsion rules when they did this – in these light winds the rules forbid excess body motion to help the boat pick up what could be some very tempting waves. At the same time, they also had to keep their eyes out of the boat to make sure they were sailing in the best breeze on the race course. Getting all this right at the same time was a challenge, and we will see just how good a job Beckett did to get within spitting distance of a medal by the leeward gate. Seven boats choose to gybe at the first mark and go right (looking upwind) and three boats continued to the left-hand side of the course. 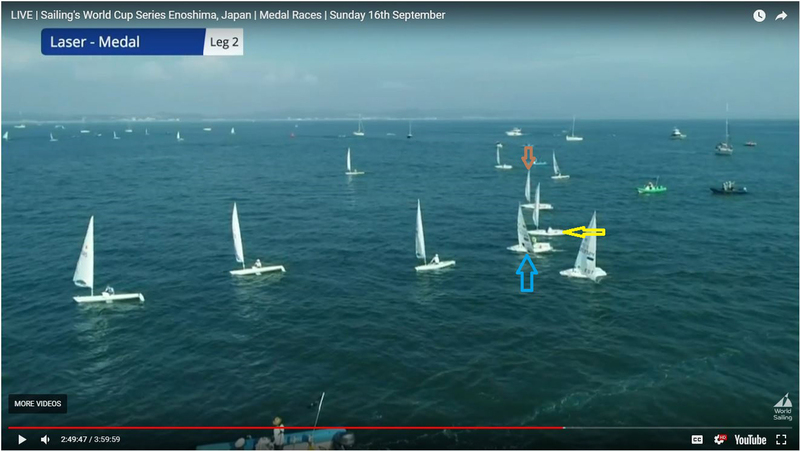 Beckett was in the group that gybed to port, and as we can see in Image 2 (where he’s highlighted with the yellow arrow) he almost immediately started to sail a little bit lower than the boats ahead and was making gains. In Image 3 we can see that Matt Wearn (AUS 199015, highlighted in brown) was also doing a good job at this point, with a combination of a puff and a wave. He’s made gains on both Hanson (GBR 212789, highlighted in light blue) and Beckett (highlighted in yellow). It looked from the angle he was sailing that Wearn had gybed, but as we can see in Image 4 (where he is highlighted with the brown arrow) he was still on port gybe; sailing by the lee and almost pointing at the mark. 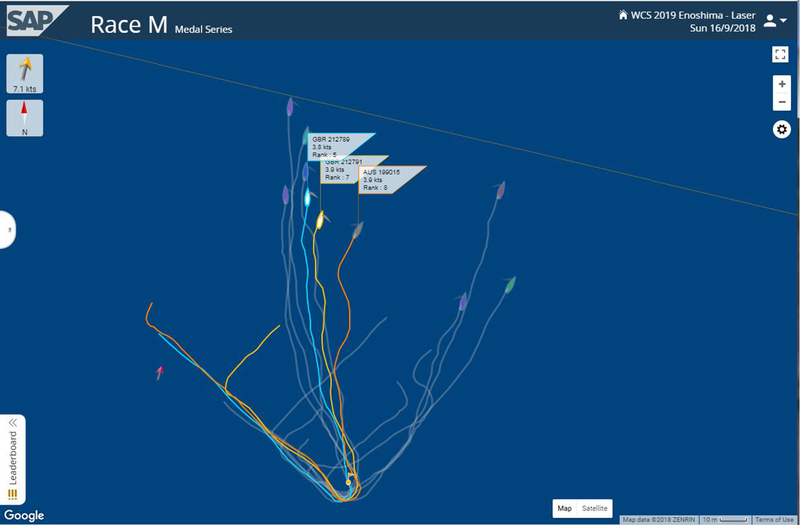 Beckett (yellow arrow) and Hanson (blue arrow) saw the gains – Hanson gybed to get into that breeze, while Beckett achieved the same result by sailing a lower angle on port. I think that tells you something about how tricky it was out there. 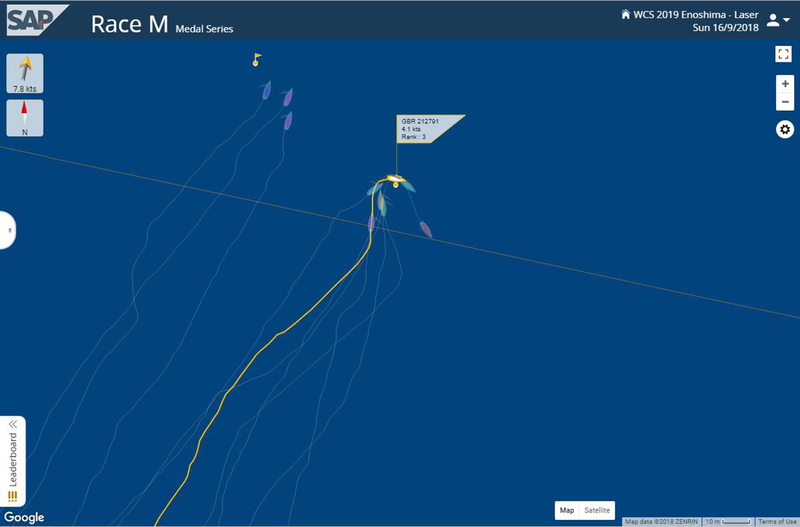 In Image 5 we can see that Beckett (yellow) had now really got the groove going and passed Wearn (brown) to pull up into fifth place. Hanson got caught out by the umpires and we can see the loop in his course (highlighted in blue) as he did the penalty… which I presume was for propulsion. Beckett’s final gains – as if they didn’t have enough to worry about – came from picking the correct gate mark. 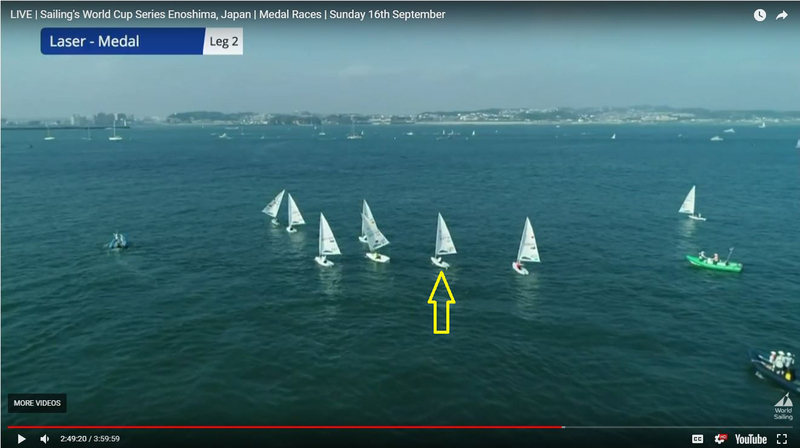 It’s much harder to tell on the water, but it’s clear in Image 5 that the left-hand mark (looking upwind, highlighted with the red arrow) was a lot further upwind and therefore closer to the fleet. The yellow line running across the image is perpendicular to the wind direction and shows this up nicely. In Image 6 we can see that three boats have picked the wrong mark. It put them out of contention and allowed Beckett to consolidate on his gains, picking the correct gate mark and rounding in third place right on the transom of the boat in front. 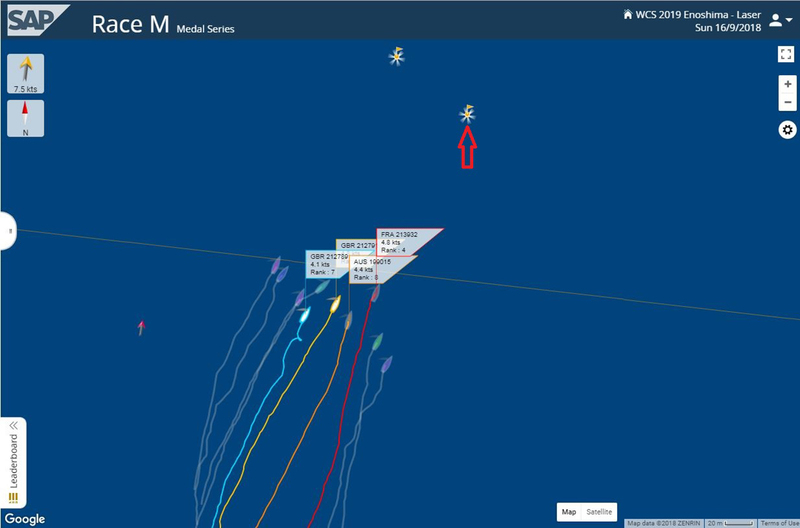 The huge advantage to this mark is even clearer in this image as the three boats who went to the right-hand mark were still sailing downwind to it as the leaders went around the left-hand mark. Michael Beckett needed to make up just one more place on the final lap to grab the bronze medal overall. And although he passed the boat ahead of him, the Australian Matt Wearn just slid by at the top mark to take second, leaving Beckett to finish third in the race and fourth overall. 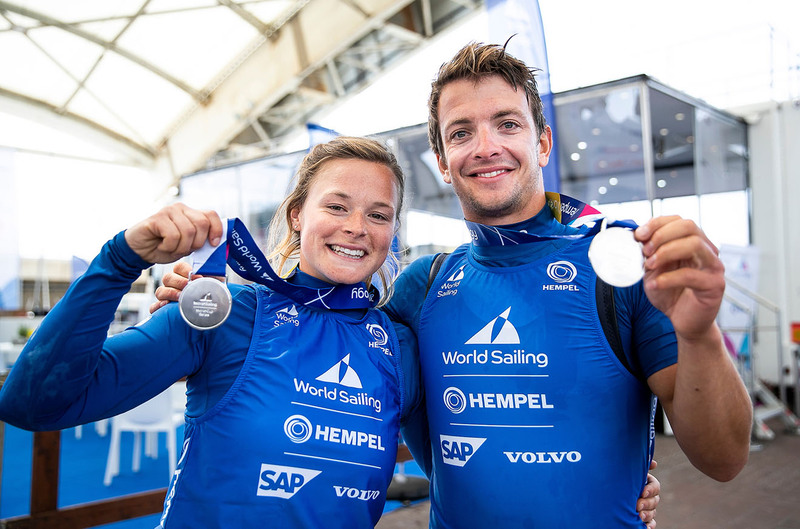 Nevertheless, it was a fine medal race performance, underpinned by that great downwind leg which demonstrated just how much you have to get right – and do it all the time – to win at this level.